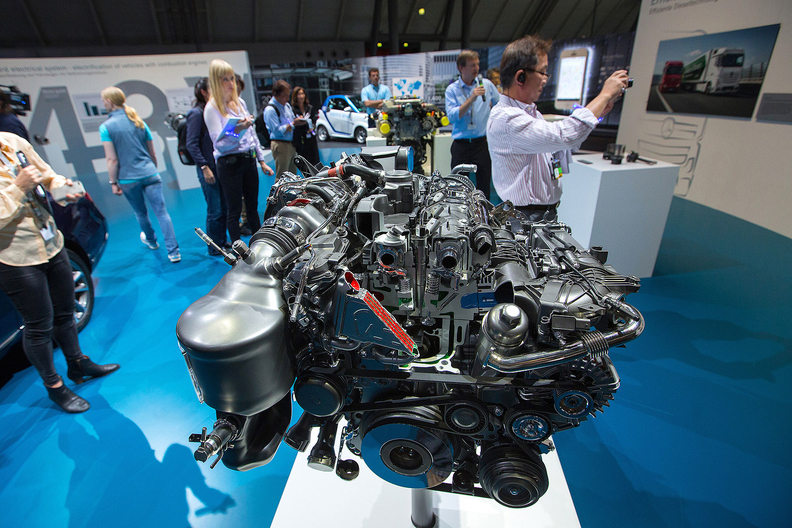 Mercedes undecided on future diesel sales in U.S.
An all-aluminum 4-cylinder diesel engine on display during Daimler's TecDay Road to the Future event in Stuttgart, Germany, in June 2016. NEW YORK -- Daimler's Mercedes-Benz USA chief said the company has not decided whether to resume selling diesel vehicles in the United States. The company has not received approval from the EPA to sell 2017 model diesel vehicles. The EPA said in September 2015 that it would review all U.S. light vehicles with diesel engines following an admission from Volkswagen Group that it had installed software in vehicles that allowed them to emit up to 40 times legally permissible level of pollution. Dietmar Exler, CEO of Mercedes-Benz USA, told reporters at the New York auto show that the company's engineers are in talks with the EPA over the diesel vehicles. He said he was not aware of the status of those talks. Before the EPA declined to approve the sale of 2017 diesel models, Mercedes-Benz diesels accounted for just 2-3 percent of U.S. volume, Exler said. "No decision made one way or the other," on the future of diesel sales, he added. Exler said the automaker plans a big boost in electric vehicles, adding 10 new EVs by 2025 worldwide, including 7 or 8 coming to the United States. "That's going to be the big focus going forward," he said. He declined to comment on the status of the EPA review, saying if a "regulatory investigation is ongoing and you are not involved, it does not make sense to comment." VW Group of America chief Hinrich Woebcken reiterated on Wednesday the company has no plans to resume sales of new diesel models in the U.S.